For the outsider looking in, translation seems to be a simple process: proficiency in at least two languages and a text are all you need to start translating. How many of you agree? Any translator worth his salt will tell you there is more to translation than merely having written words on a piece of paper. Let us outline the translation process. A translator starts the translation process with reading the source text in order to gain a general understanding of the text. 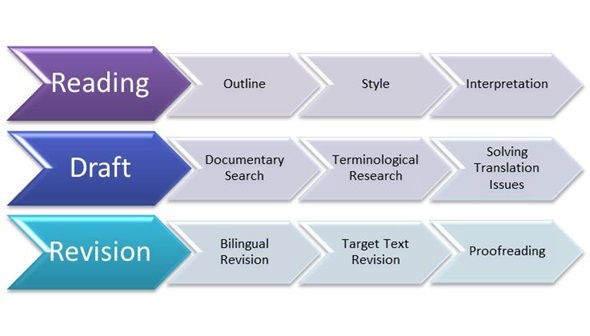 A translator will determine the outline of the text, key ideas, the level of language, the style, the tone, the terminology used in the source text and identify segments that will require research on his part. Cultural references, innuendos, connotations will be identified and processed while executing the next step. Grasping the metalanguage of a text is crucial to the translation process. This is essential to the interpretation of the source text. After reading the whole document and doing the preliminary work, a translator will start writing his draft of the target language text. He will keep in mind the features of the text and the target readership during the writing process. He will solve translation issues as they come up. This step is the most important and often the longest since research is done at this stage of the process. Once the draft is completed, the translator will perform the last step. This step encompasses much more than simply proofreading the target text. First, he must perform a bilingual revision, which consists of double-checking the target text to validate that it conveys the same message than the source text. When he is satisfied that the target text is faithful to the source text, he will perform a unilingual revision. During this step, the translator will correct syntax, grammar, spelling, typography and ensure that the product is both faithful to the source text – cultural references, innuendos and connotations, just to name these particularities – and a quality product (devoid of redundancy, ambiguity, loan translations, grammar and spelling mistakes ) written in the target language. As you can see, translation requires a meticulous and thorough analysis of the source text, research, a methodical execution, and both bilingual and unilingual revisions. Personal work process might differ, but these steps ought to be included in it. Do not confuse translation process and translation techniques. You already know what the first one is, the second one refers to linguistic transfer.